Because the technology of radio astronomy becomes more difficult with decreasing wavelength, both in receiver construction and required accuracy of the antenna dishes, millimeter radio astronomy has long lagged behind work in the centimeter waveband. Millimeter work seemed a rather narrow scientific niche for some years, being occupied largely by work on emission lines from molecules in star-forming regions and their surroundings. Much of the extragalactic community took note of the millimeter range when it was demonstrated that one could detect the coldest dust in galaxies in the submillimeter, on the long tail of their blackbody-like spectra. A few sites have been exploited for very dry conditions so that observations are often possible in several windows in the submillimeter range as well. 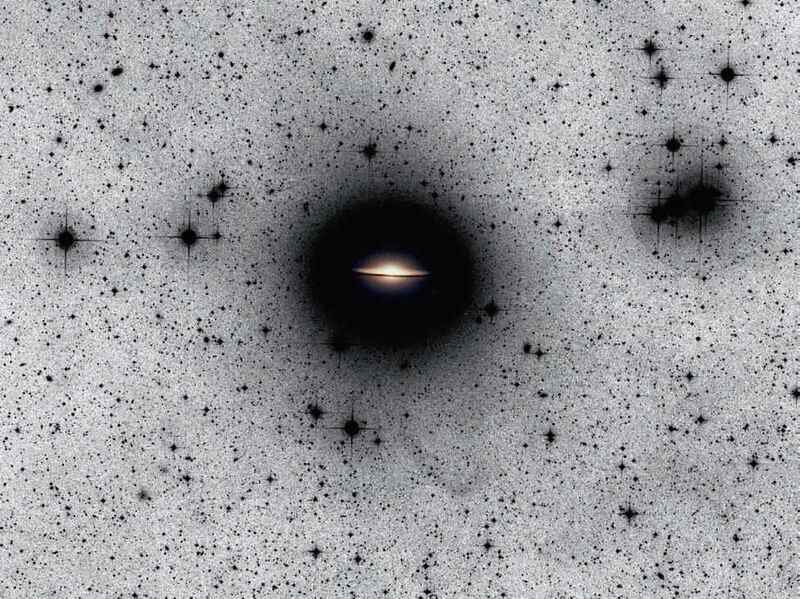 Existing instruments (such as the James Clerk Maxwell Telescope on Mauna Kea) have been able to detect the dust components of high-redshift galaxies in this way. As with the impetus to build JWST, it happens that questions of both star formation and galaxy formation would be handled effectively by millimeter observations of unprecedented sensitivity and angular resolution, for both spectral lines and the continuum from dust grains. It is now possible (and routine, on a small scale) to carry out interferometry at millimeter wavelengths. For a decade, there have been efforts to construct an analog of the VLA to work in the millimeter regime. Detailed studies were done by the US National Radio Astronomy Observatory, the European Southern Observatory and several partner institutions, and the Nobeyama Radio Observatory and National Astronomical Observatory in Japan. 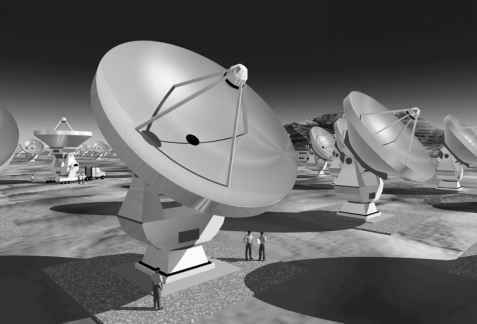 The separate projects developed close ties, and have now been amalgamated as the Atacama Large Millimeter Array (ALMA), perhaps the first genuine "World Array''. ALMA is now foreseen to include 64 12-meter antennas (Figure 11.6), with the size a compromise between the field of view that can be mapped at once and the array sensitivity. They will be spread in configurations as large as 10 km, affording angular resolution as sharp as 10 milliarcseconds—substantially better than either the VLA or HST can now deliver. The site will be on a high plain in the Andes of extreme northern Chile, 5000 meters above sea level on the Llano de Chajnantor. Site tests have shown the atmosphere in this region to be extremely dry, comparing favorably with the South Pole. Its receivers should cover bands from 0.35 to 10 millimeters in wavelength. that the detectability of galaxies actually rises with redshift near z = 4, with the rapidly rising spectral shape more than compensating for increasing distance. ALMA should be able to detect dust emission from massive galaxies to z = 20. The prominent CO emission lines, in a ladder starting at 2.6 mm and extending to multiples of this frequency (115 GHz), are an important tracer—almost the only sensitive tracer—of molecular gas, and thus of conditions for star formation. The strong lines marking transitions between molecular of low angular-momentum quantum number J have been detected from a handful of luminous galaxies and QSO hosts at z > 2, using the Owens Valley and Plateau de Beure interferometers. This bodes well for the systematic use of these lines to trace the history of star formation and gas content in galaxies. ALMA should be able to measure the CO lines for normal galaxies to z = 1, and for very luminous systems to z = 3, while the exceptional objects detected so far should be found to yet higher redshifts. In the more local Universe, ALMA should be able to detect CO emission and measure its velocity structure in more galaxies than any existing instrument can do in H i; in other words, for typical abundances of CO and gas content, ALMA will be more sensitive to the cold ISM than any existing instrument is, even using a minority tracer. This means that the Tully-Fisher relation can be traced to redshifts of several tenths, potentially illustrating luminosity evolution. In addition, ALMA should be able to trace the ISM by means of the strong carbon fine-structure lines which ISO has shown to be ubiquitous and strong in nearby gas-rich galaxies. For redshifts of a few these lines come through the ALMA sensitivity range (dictated by atmospheric transmission).